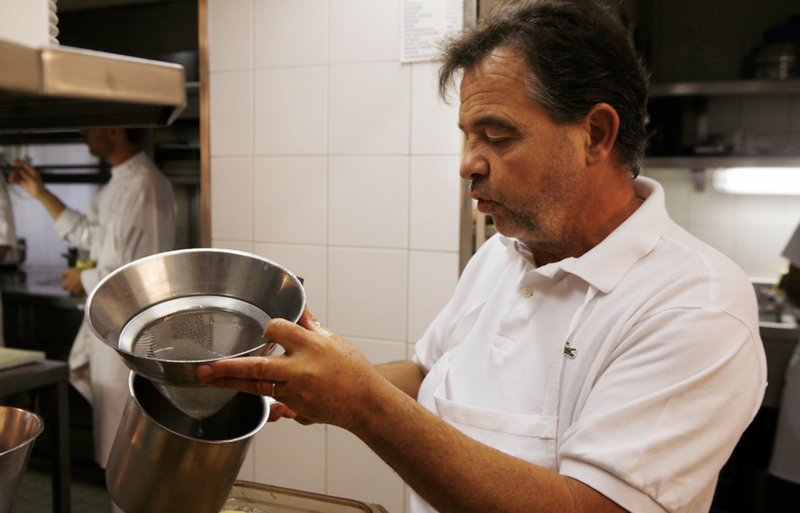 Inconceivable these days, Bernard Pacaud began his apprenticeship with the Lyons culinary legend La Mère Brazier when he only 15 years old. Her demands on the quality of ingredients of all kinds defined Pacaud’s cooking philosophy very early: “Only use the best. The guests end up paying for it”, he says. Pacaud also does not pose for front pages and rarely appears on television. “I’m just interested in doing my job as well as possible,” he says. For a moment Bernard Pacaud appears lonely in the middle of his restaurant. Behind him lies the noble Place des Vosges, in the opinion of many the most beautiful square in Paris. Left and right, the dining room brigade inspects every detail again, watchful looks combing the interior in 17th century château style for inaccuracies. Is the distance between tables correct? Is the historical tapestry without wrinkles? Do the spotlights in the front dining salon point the right way? Just now Pacaud himself has just straightened a candle wick. Then he goes into story-telling. First the foams and jellies that are served everywhere today. “I prefer the emotion to the emulsion,” he grumbles, tightening his blue apron. Then comes the memory: His youth, spent with Lyonnais gastronomy when thrushes and snipes were still grilled and the écrevisses pattes rouges (red-footed crayfish) were in the kitchen transformed into delicious gratins and quenelles. “We had so many crayfish that we sold their shells to other restaurants so they could make crayfish butter.” Today, the real, wild pattes rouges are almost extinct. “Back in Lyon, we used only manicured Bresse poultry.” Manicured poultry, if you pardon me, I ask. “The chickens had to be clean, the farmers had to be clean. La Mère Brazier demanded this”. Bernard Pacaud experienced it himself. He has over 55 years of experience in the top echelons of gastronomy. When Eugénie Brazier (1895-1976), the best chef in Lyon, hired Pacaud, a Breton orphan, she was a living legend who had six stars in the Guide Michelin for her two restaurants. There’s the story that in 1953 the directors of the Waldorf Astoria in New York had offered her an annual salary of $ 150,000. Eugénie refused. Allegedly, an Indian maharajah is said to have offered her a kitchen with pots of pure gold. Again, Eugénie refused. Only once could she not say no, when a man from the utility company came to the door. The restaurant must now be connected to the mains, he explains. The time of wood and coal stoves is over. And Eugénie Brazier said, “If there is electricity in my house, then it will be home-made.” She then installed a generator in the basement. Sometimes customers, suppliers, and friends tell him that the business about the cult of great produce is basically a thing of the past. Pacaud rolls his eyes: “After La Mère Brazier, I worked for Claude Peyrot in his Restaurant Vivarois in Paris. He was one of the most creative chefs back then. The first curry oysters – that’s what he was most known for. But the product remained the star. At that time, we did not have to paint with ingredients.” The pure tradition of Eugénie Brazier, the fresh ideas of Claude Peyrot, these were the beginnings. In the tiny restaurant that he opened in 1981 on Rue de Bièvre on the Left Bank, Pacaud wanted to do everything differently. “It was meant to be a restaurant for friends..” Daily specials from the blackboard, two men in the kitchen, two in the service. On Monday there was pot-au-feu, Tuesdays, veal ragoŭt. The simple little restaurant won high gastronomic honors in just two years. A move was called for. Pacaud relocated to the ground floor of the stately Hôtel de Chaulnes (1605) on the Place de Vosges. “Just the best for the guests,” Pacaud tells me. Pacaud told me, “There’s still some left, namely to continue to do my job as well as possible.” And indeed a visit to L’Ambroisie shows that even in today’s kitchen nothing can replace first-class produce. The lobster with chestnuts and pumpkin in sauce diable is one of his classics, which he sautés with cognac, the diable, or devil ingredient, is married with the crustacean’s iodine – a clever but not overly-complicated creation. He sometimes prepares a tourte for his guests, a large warm pâté under airy puff pastry. Sometimes it hides scallops, other times game birds. Today’s tourte is impressive as soon as the server cuts it open. Pacaud has skillfully stacked the duck breast, roasted to perfection, with duck liver. Sometimes a little veal is included; a wonderful dish that is almost never served anywhere else. Why isn’t it? Pacaud raises his eyebrow: “The tourte must be prepared before the evening service and because of its temperature and fragile freshness, it has to be served to the earliest-arriving clients. For dessert Pacaud likes to serve a simple chocolate cake. It tastes heavenly and is accompanied by traditional vanilla ice cream. Is there a secret to the recipe? A trick? Pacaud marvels at the question, “You should use good chocolate,” he says. The seemingly simple arlettes from our menu gain in depth accompanied with wine, for example a sweet Vouvray moelleux “La Coulée d’Or” from the Domaine Bourillon-Dorléans. One of the best dishes on the menu is sweetbreads in all shapes and sizes, for example with Quenelles à la financière (poultry quenelles) and macaroni. The quenelles are surprisingly light and have lost their grandmotherly floury heaviness. In general, the sweetbreads that he serves come with capers. At L’Ambroisie, clients who don’t ordinarily like organ meats end up liking his sweetbreads. The lemons provide freshness, the capers for spice. Again, a harmonious, seemingly simple dish. “I do not create, I simplify,” says Pacaud. “When I can tweak my dishes as little as possible, I am satisfied. This is why Frenchman secretly admire Italian cuisine: Clear aromas, seemingly simple preparations, and, in their apparent simplicity, completed beautiful dishes! But those who only eat in Paris cannot understand that. The sense of good products is also rapidly being lost.” This is Pacaud’s biggest worry: “People unlearn eating,” he sighs. “They say that beef and chicken are tough when these animals still have muscles. They like sweet flavors in appetizers.” But where can you still learn to eat, or rather get to learn? Pacaud shrugs and looks at the spotlessly white table. He does not give the obvious answer: At L’Ambroisie in Paris on the Place de Vosges.